The Journey So Far | JustRunLah! As a kid I was alright at running. ‘Catching’ was my favourite recess activity in my primary school days, and I remember coming in first in class in my first and only NAPFA clocking 8:06 for the 1.6km. I was later selected in Year 7 and Year 8 (Sec 1 and 2) to represent my school at the State Cross Country (South Australia) Championships which I turned down. I also came in third at my school’s 100m sprint in Year 8 (Sec 2) and participated in the 4x100m at the Achilles Cup that year. My relay team came 0.03s from breaking the tournament record. I also represented my school in Orienteering and Rogaining. And that was it. Then came NS. I ran a 9:11 2.4km in BMT before succumbing to pneumonia in OCS. And that was it, yet again. Fast forward 4 years and a few of my mates decided to join the Melbourne Marathon in October 2016. We signed up for the run in the heart of one of Melbourne’s most treacherous winters, making it close to impossible for a new runner to start training. I began my training on a short family trip to Newcastle in August, where the weather was far more pleasant. I didn’t have running shoes and I clocked two extremely painful undulating training runs, around 6 and 8kms each from memory and clocking 4:50/min pace. I had no support network as my mates were YOLOing the race and I was unable to find a club or group, but I pressed on with several lonely long training runs. I relied solely on ASICS’ online training calendar. 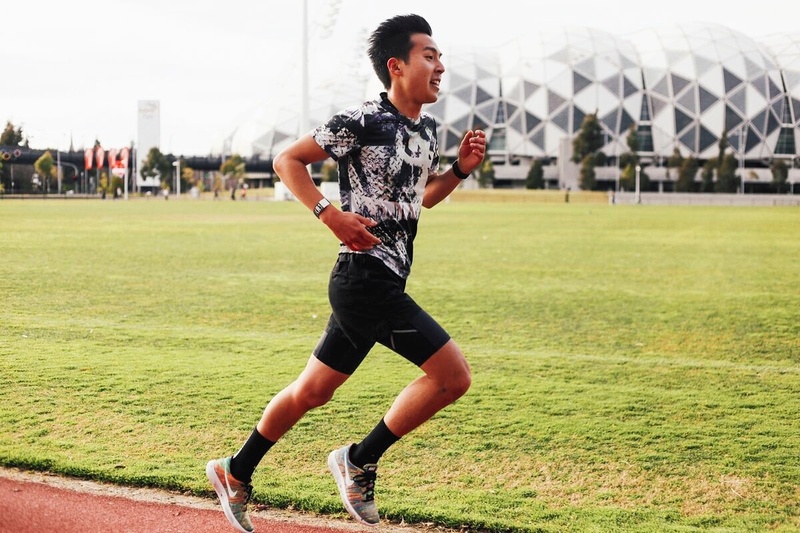 The longest training run was 26km of repeat loops of Albert Park Lake in winds of up to 50km/h. I knew my training was not enough – I did not incorporate variance into my training; there was no speed work nor hill repeats, and I never ran close to the race distance. Long story short, I was cooked on the day. I had a modest goal of running a sub 4 hour race which I barely executed with much agony. Forget negative splits, I ran a 1:48 first half and a 2:08 second half after straining both hammies up an extended 2-3% gradient 2km climb towards the end of the race. Many lessons were learned that day. Skipping a last minute sign up for the Standard Chartered HM 2016 which I ran with no training and acclimatisation (5:09/min), I came close to giving up running numerous times. What kept me going was my love for physical activities. With a hectic schedule working part time and undertaking my LLB studies, I needed a sport which I could do independently. The key to transitioning to become a runner (i.e. actually enjoy the sport) however is finding a running community. I am a massive fan of Nike Run Club (NRC) Melbourne and have made amazing buddies. NRC taught me the importance of a varied training regime and I have been a religious attendee since February 2017. I also recently joined Track Tuesdays at Olympic Park after working hours. It is the fantastic initiative of an ex NRC pacer and friend Georgina who has since moved to London. Sad days. We run Mona Fartleks and 6x800m among other speed and threshold trainings. Having a role model, someone to chase after, someone to scream out ‘you are doing amazing’ while running and a social setting before, during and after a run session brings so much meaning to the sport. Rocking up to training doesn’t feel like an obligation as it eventually becomes something you look forward to after studies or work. I am grateful to be surrounded by groups of supportive and inspirational runners. I was stagnating at a 20:30 5km and a 45:00ish 10km before and long after Melbourne Marathon 2016. As a newcomer to the sport I slugged it out at NRC sessions and used my first 10km race at Sri Chinmoy’s Williamstown Foreshore run to find out my base fitness (4:08/min). I figured that staggering events throughout the year might be a good way to work towards setting PBs and structuring and scheduling rest/training. I have been focusing on half marathons since that 10km event. The events I peppered onto my calendar included the Herald Sun Run 4 the Kids 14.6km (Ran with a cold; 4:18/min) in April, Wings for Life in May (25.05km; 4:48/min for 21.1km before straining my right calf), Run Melbourne HM (4:24/min) in July and Sandy Point HM in August (4:18/km). At Run 4 the Kids, I set myself a goal to run a HM at my race pace. My final HM for the year is the Blackmores Sydney Running Festival in a weeks time when I visit family up north, after which I will be focusing on cycling and 5km. I am not positive of breaking 1:30 (4:15/min) in the event as Sydney is pretty undulating, but its worth a shot! I was inspired to focus on 5km by a mate and amazing run coach Chris, and Tim from NRC who called my 5km time ‘soft’ after I expressed concerns about my stagnant 20+min 5km (4:05+/min). After a couple of track sessions and driven by that burning desire to not be ‘soft’, I managed to clock a 3:58/min and 3:52/min 5km over longer training sessions. And it surprised me what speeds training does to your HM timing – It builds up your threshold speed; it allows you to hold above race pace for extended periods of time and it gives you an extra gear towards the finish line. I promise to keep all subsequent posts shorter and I guess this long background piece demonstrates my passion for running. Running is forward thinking through goal setting. It is a mental sport. It is team work. It requires individual effort and discipline. And you can keep breaking PBs all the way into your 40s (except for sprints …). Click here for more post from Simply Bryan. I assume you are not based here in Singapore because you will never get lonely as running clubs are all over the island. Plenty of clubs and crews here as well. Its about taking that first step to commit to one thats often the barrier for new runners!